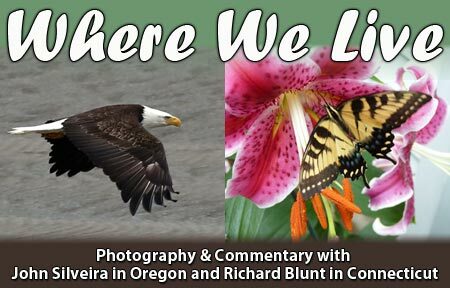 I go to the Port of Gold Beach almost every day, and I do so about three times a day. I’m looking for birds. 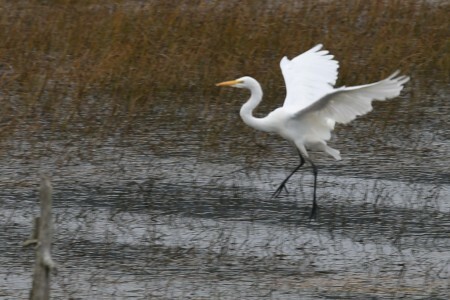 In my last post, I promised some photos of a great egret doing something I’d never seen before, and here they are. 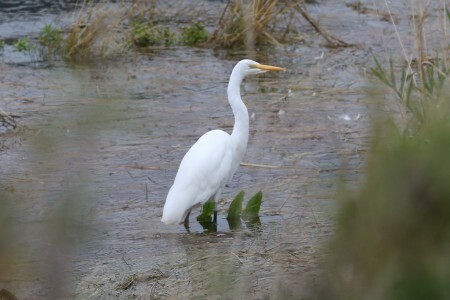 It started several days ago when I went to the port and on the other side of the water was the great egret I usually see down there. I took a few photos, all the while hoping it would take flight so I could get some photos of it flying. I got more than I expected. 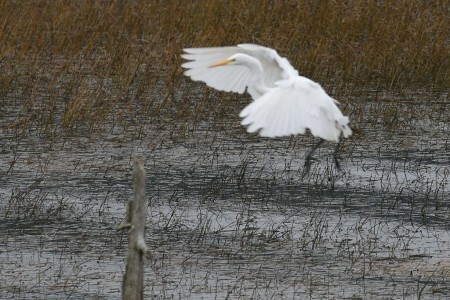 However, because he wasn’t flying (yet), I slowed down my shutter speed to 1/250th of a second so I could drop the ISO. As you’ll see, that was a mistake. I was using my Canon 5D Mark III with my EF 70-200mm f/2.8 L IS II USM lens. I also had my EF 1.4x II Extender between the camera and lens, which expands the focal length by 40%. (This was several days before I dropped the extender on the floor, which is grist for another post in the future.) Most of these photos are cropped. I should also add that the 5D Mark III is fantastic low-light camera and that I probably shouldn’t be worrying about the ISO speed, especially when it’s only around 800. But old habits die hard. 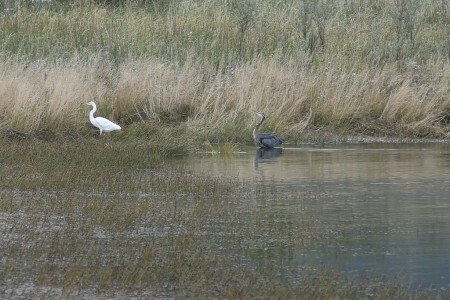 Minutes after I arrived, a blue heron showed up and contested the egret for its place on the shore. 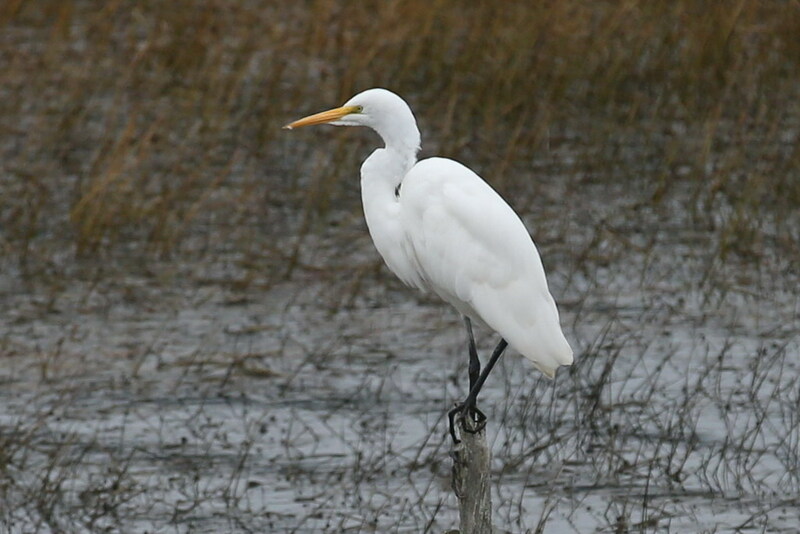 What I didn’t realize was how much bigger blue herons are than great egrets. 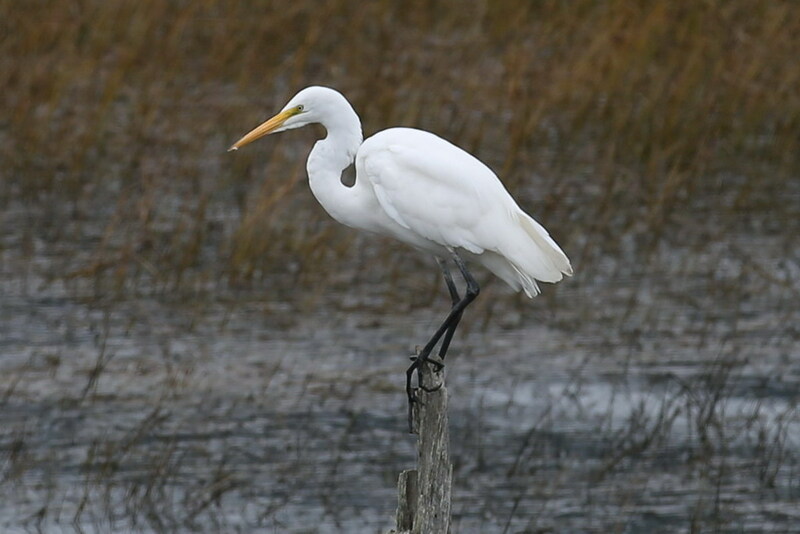 (I should also mention egrets are in the heron family.) When it appeared, the egret was clearly intimidated and, though at first it appeared indecisive, as the heron approached it, the egret took off and, as luck would have it, it flew towards me, then it landed on a tree stump within forty or so yards of me. 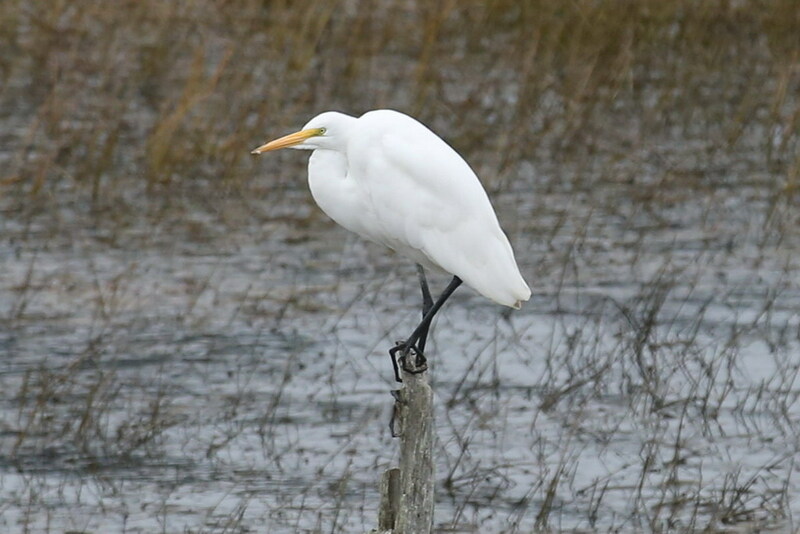 There it perched, and that’s what I’d never seen one do before — get footing on a perch so small. 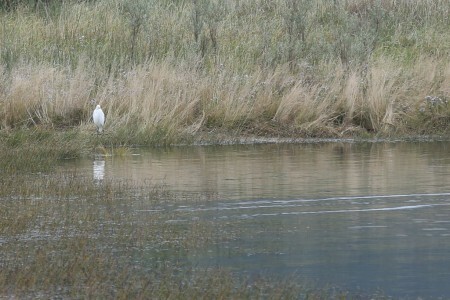 This was one of the first photos I took this day when I saw the egret across the water. He was alone and looking to feed. I still had the shutter speed set at 1/1000th of a second. But, since it upped the ISO level, I slowed the shutter down to 1/250th of a second. Big mistake. 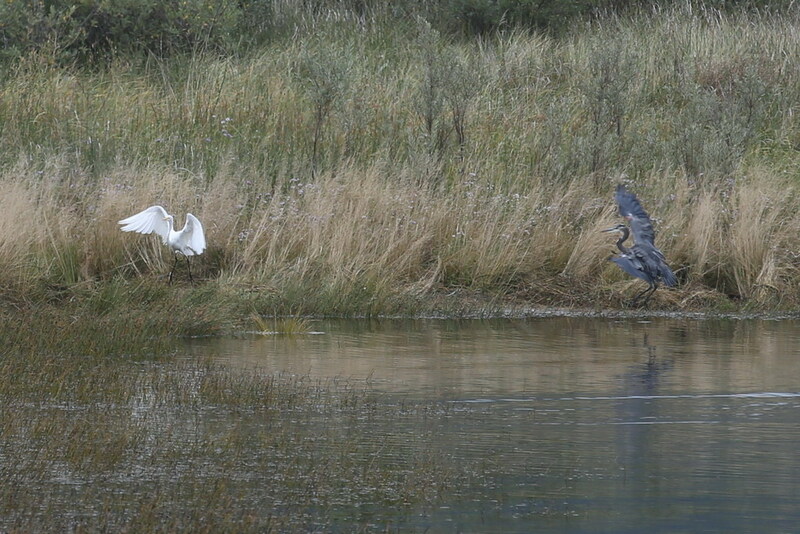 The blue heron suddenly showed up and the egret wasn’t happy. 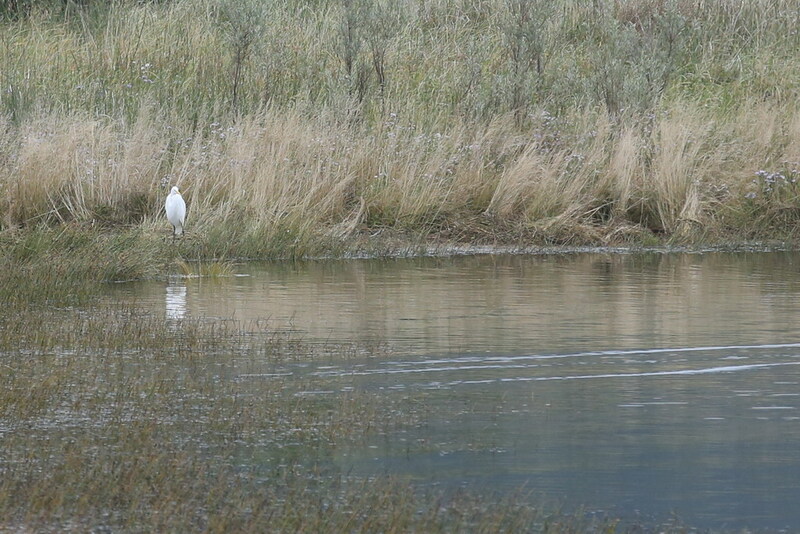 I thought, at first, the egret would be able to ignore the heron. 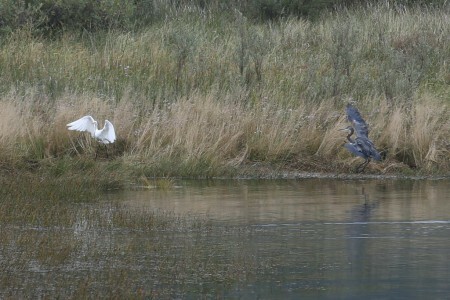 The heron was going to have none of that and quickly drove the egret off. 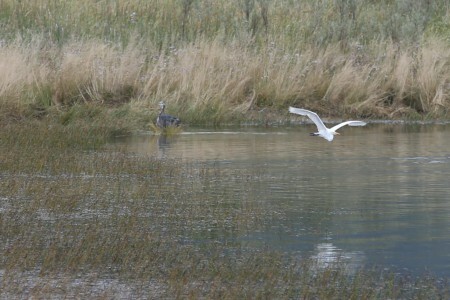 As luck would have it, the egret started flying towards me. Of course, the bad news is that, while it was flying, I had a shutter speed that is really too slow to freeze birds in flight. It’s too bad that I had gone to the slower shutter speed because the photos of the heron, as it approached, are all a little fuzzy because of the motion. They’d have been beautiful if I hadn’t changed the setting. But in this photo, the heron is about to alight on the tree stump. This is what I’d never seen before. I just didn’t know it was built to do this. The egret uses its wings like air brakes as it comes in for a precision landing. Now using its wings for balance, the bird gets ready to steady itself on the stump. And here it is, perched on the stump. Even Jeff Ferguson, the new marketing manager, here at Backwoods Home Magazine, said he’s never seen an egret perched like this. Frankly, I think it’s beautiful. 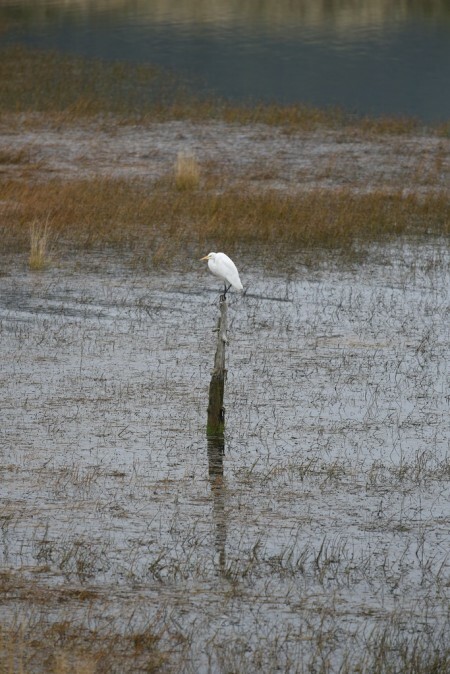 I’m probably athropomorphizing, but I’d say the egret looks like he (or she) is sulking after getting kicked off the other side of the port by the heron. In the meantime, I had reset the shutter speed to 1/1000th of a second, in case it took flight, again. To give you an idea of just what the egret is sitting atop, this is an uncropped shot. 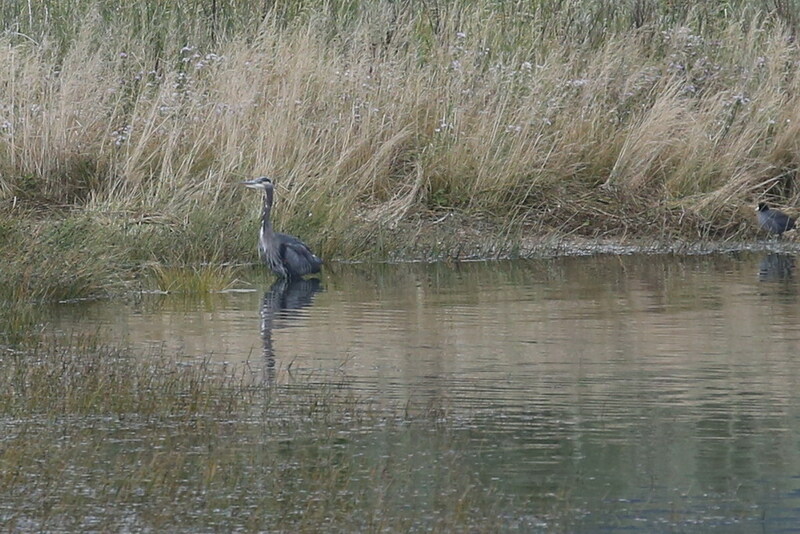 In the meantime, this is what its nemesis, the blue heron, was doing on the other side of the inlet. I’m just putting this one up because the bird is so beautiful. 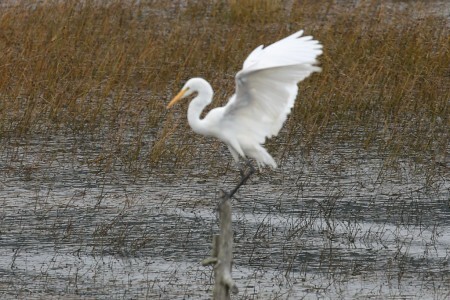 Finally, the egret took off and started flying across the port, again. I’m a sucker for birds flying over water. 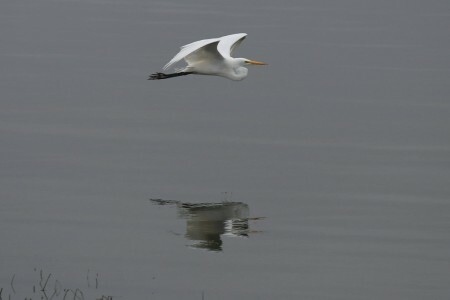 It settled down on the shore, just below the roadway, before it took off, again, and disappeared for the rest of the day.